Why is Expedia Called Expedia? I’m writing this article on a flight to Chicago so it only feels right to taxi into some travel puns (sorry). Ladies and gentlemen, the captain has turned on the fasten seat belt sign. If you haven’t already done so, please stow your carry-on luggage underneath the seat in front of you and turn off all electronic devices. Please make sure your seat belt is fastened, your seat is in its full upright position and your folding trays are in the up-right and locked position. Now sit back, relax and learn the journey behind why Expedia is called Expedia. Brand Expedia (subsidiary of Expedia Inc) is an online travel company that was founded on October 22, 1996 by an internal group at Microsoft. For several years, the company was run by Greg Slyngstad, Richard Barton (Group Product Manager and the person who pitched Bill Gates the idea- no pressure), Soraya Bittencourt and Byron Bishop. 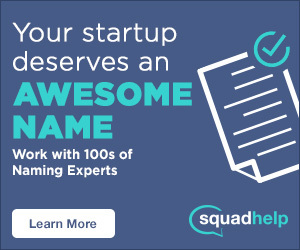 The online travel startup was incubated and funded by tech giant, Microsoft. Shortly after the company launched operations in the United Kingdom, Bill Gates decided to silo the company and take them public in 1999, raising $72.8 million (with Microsoft owning 86.4% of shares.) Prior to their IPO, Gates named Richard Barton President and CEO of Expedia. In 2001, USA Networks, Inc (previously Ticketmaster) acquired a controlling interest in Expedia for an estimated $1.5 billion. Two years later, USA Interactive rebranded to InterActiveCorp (IAC) and purchased the remaining 46% of Expedia shares from Microsoft for $3.3 billion. In 2003, Barton stepped down as CEO and in 2005, IAC spun off their travel group of businesses under the brand name Expedia, Inc – which now operates as an independent, publicly traded company under the stock ticker “EXPE.” You can learn more about this divesture here. Today, Expedia allows users to book airline tickets, hotel reservations, car rentals, cruises, and vacation packages. Furthermore, they help travelers discover unique things to do during their trip. The company operates over thirty localized sites across the globe, employs close to 7000 people and their parent company Expedia Inc owns a bundle of additional companies, including hotwire.com, CarRentals.com, Trviago, Travelocity, Egencia, elong, hotels.com, venere.com, Wotif Group, Classic Vacations. They’re also currently in the process of acquiring Orbitz for $1.6 billion. For over ten years, Expedia has been CEO’d by Dara Khosrowshahi and is currently headquartered in Bellevue, Washington. Although just last week, Seattle Mayor Ed Murray announced that Expedia is moving their headquarters across the lake to Seattle, taking over the old Amgen campus. The move is set to be complete by 2018. Why is it called Expedia? Richard Barton (also the founder of Zillow and Glassdoor) was previously responsible for creating CD-ROM travel guides at Microsoft. As the CD-ROM market started to collapse, he transferred to the multimedia team and developed the idea of selling travel online. At first, he considered naming the company “Microsoft Travel,” but quickly changed his mind. The word Expedia is derived from a combination of “exploration and speed” and at the time, the domain only cost $9.99, according to Barton. If you are curious about what Barton means by “high point Scrabble letter (X) in the tweet below, check out his article on picking brand names. SEE ALSO: Why is it called Hipmunk? For years, Expedia focused on advancing their “Expert Searching and Pricing” (ESP) technology so end-users could easily research, plan and book flights on their own – skipping a call or trip to a local travel agency. Humans are habitual creatures by nature, most avoid change when necessary. One by one, Expedia had to earn trust and convince the market that there was a more convenient way to book travel. Remember, back then people were skeptical of transacting online, unlike today. Modifying behavior doesn’t happen overnight; it happens slowly by repetitively proving convenience and exceeding expectations. 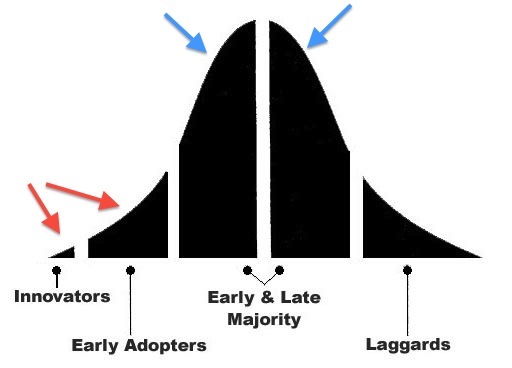 Eventually, innovators and early adopters transfer the message to the mainstream. From here, word of mouth drives awareness and starts altering the behavior of the majority. Even tech laggards join (Hi, Grandma). This concept is know as “idea diffusion” and was first proposed by Geoffrey Moore. 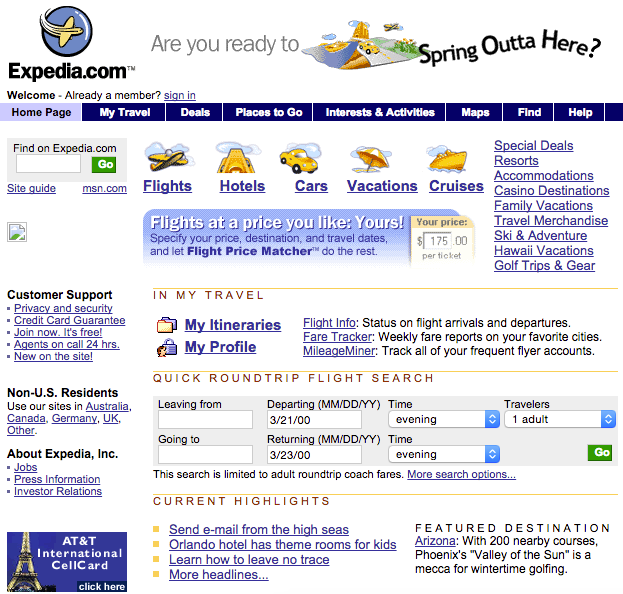 Expedia’s logo has experienced subtle changes over the last two decades. The logo closest to the sunset was Expedia’s very first logo after they spun out of Microsoft. Like other brands in the late 90’s, you’ll notice .com was included in their original logo, but later dropped in their second iteration. In December 2009, Expedia dropped the yellow cartoonish plane and updated their logo with a more sophisticated white plane stretching across the globe entirely. Although it’s hard to see in the image above, the logo also received a new tagline “Where you book matters.” Their previous tagline was “Don’t Just Travel. Travel Right,” however it was not incorporated into their logo. As before, an airplane and circular blue “globe” make up the new logo. But the plane is white, not yellow, and the whole look and feel is “less cartoonish,” We were striving for a more timeless and classic aesthetic,” he said. “It’s a little less whimsical and more sophisticated.